A popular trend in China and Taiwain makes its SoCal flush -- er, bow. The latest addition to the City of Industry restaurant scene? The Magic Restroom Cafe from chef YoYo Li. There have been many interesting restaurant trends over the years -- cowboy cuisine, flower salads, things cooked on spits -- and there've been a few restaurant Trends that are so outlandish or unusual that Trends merits a capital T.
Think eating in total darkness or nibbling cookies while visiting with a clutch of in-house kittens. But the Magic Restroom Cafe, the latest addition to the City of Industry dining scene, may just eclipse them all for sheer what-in-the-world-ery?! and oh-wow-ness. The cheeky -- take that word how you will -- eatery is indeed modeled on a restroom, complete with toilet seats, showerheads, tile details, and wall-lining urinals. And those seats? Yeah, they're decorative only. As are the smaller toilet bowls that hold entrees. Jonathan Gold reports that chef YoYo Li was inspired by the successful restroom-themed restaurants of Taiwan. Curious to know more? A popular chain is called Modern Toilet. Indeed. Magic Restroom Cafe just had its soft opening on Oct. 12, meaning that lookie-loos galore will soon be calling upon the 2,800-square-foot Gale Avenue business to take photos -- get ready, social media -- and check out the savory rice and noodle dishes. Shall jokes and asides be made by practically every diner that visits the Magic Restroom Cafe? You bet. It's definitely a conversation-starter, and continuer, and if you aren't telling everyone you know that you went there for the next several weeks, well, you'll likely be the exception. But how are the Magic Restroom Cafe's restrooms? So often the bathroom is what gets marks in an eatery's reviews. 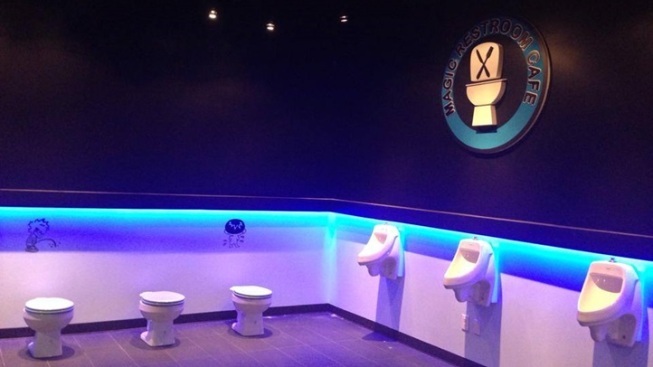 At least the waterworks, plumbing, and toilets are well on display at this already buzzy dining destination (on display for design purposes only, of course). Oh, restaurant themes. You do amuse. Of course we're all heading to the City of Industry to check this one out. Did we say "wow" already? With an exclamation point? How about again? Wow! The Magic Restroom Cafe is at 18558 Gale Avenue, Suite 222, in the City of Industry.